Well, it was almost a lot longer wait than just a few entries since our last visit with Dave Bartholomew because when doing the preliminary research for release dates Billboard magazine had their review for this in May 1948 – six full months after it came out! But that was fairly typical for rock’s earliest days. The music was made primarily by small labels with few connections to major publications, no advertising budgets, maybe not even the spare change to send an advance copy to the editors of Billboard for review. As for the magazine itself, they covered all of black music only incidentally and their attention was mostly confined to a handful of bigger stars on major labels who’d enjoyed some crossover success. As for the overall genres of music outside of pop, jazz got the biggest share but even that rarely focused on the more cutting edge styles like bop. Otherwise they largely turned a blind eye to other so-called “niche” styles from the margins of society, including country (which they referred to as Hillbilly or Folk), gospel and blues. At the bottom of the totem pole was rock ‘n’ roll, which was almost a complete non-entity at the time. In this case however perhaps it’s all for the best, as Bartholomew and DeLuxe Records could not have wanted the small modicum of notice that the esteemed writers of Billboard gave it and its flip-side, entitled “Bum Mae”. Of that they wrote simply “Bum Record”, leaving no lines to even read between, as if the message wasn’t clear. 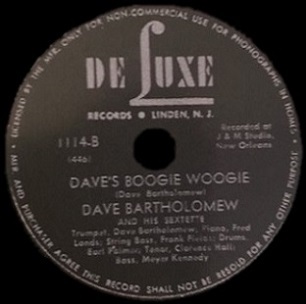 For the focus of OUR review – Dave’s Boogie Woogie – they rhapsodized, “Worse than the flip”. To think – it took them just six months to come up with such brilliant analysis! No wonder they’ve been in business so long! Hard to beat that insight I’ll admit but I’ll try anyway. As we were introduced to Bartholomew last month with his debut record, She’s Got Great Big Eyes, a halfway decent attempt with decidedly mediocre results, his background – or his future – needs no further rehashing here. It’s simply enough to state that at this time he was still an artist first, not a producer, and one stuck between styles to boot. His musical upbringing, his experience playing in the Army and later as a bandleader around New Orleans after his discharge, as well as his own personal musical TASTE all leaned towards Dixieland jazz. His commercial instincts however, even this early in the game, seemed to sense something else was more appealing to the masses and so he gravitated in that direction. Not entirely though and that’s the problem. He still seems unwilling to completely give up his loftier aspirations as a jazz guy. To that end “Bum Mae” was jazzy-pop. Rather slapdash sounding to me, but as much as I appreciate Duke Ellington, Lionel Hampton and Charlie Parker, jazz is not my thing so I’ll leave it to others to classify and analyze that one. I wouldn’t go quite so far as to call it a “bum record” but neither would I praise it. If that – and the flip of his earlier record, “Stardust”, done in a more straightforward jazz approach – were the TYPE of jazz he’d be churning out, then, jazz novice or not, I can’t envision him winding up in a Jazz Hall Of Fame somewhere down the road. But then again, would anyone based on She’s Got Great Big Eyes and Dave’s Boogie Woogie ever think he’d land in a Rock ‘n’ Roll Hall Of Fame? This record is slightly more engaging to my ears than the jazz stuff, but because my rock standards are also much more well-established it won’t be able to skate by due to any lack of awareness as to what was required to make for a worthwhile product. Musically Dave’s Boogie Woogie isn’t terrible. It features a fair melody with a solid intro, some decent trumpet work by Dave in the break, though it’s the piano that steals the show throughout with a strong bass-line pattern and some nice intermittent right hand fills. Though hardly aiming high it shows competent playing and reasonably good ideas, particularly his accenting the off-beat, something he’d later perfect and would help define rock forever more. Overall it’s pretty basic, borderline simplistic maybe if you want to be crass about it, but there’s nothing really wrong with that aspect of the song. While it’s definitely not music that will make you sit up and take notice, nor even anything you’d remember an hour later, it’s also not the musical side of the equation that’s going to drag this under. For that we turn to the other two components, the juvenile and utterly pointless lyrics and the grating vocals used to convey those lyrics, the combination of which makes it perhaps his weakest single release of his long luminous career. Dave always had a unique voice, certainly not a warm inviting tone, but usually far more engaging than what is shown here. The others in the band join him, doubling his lead, though he’s clearly out in front, and they’re not helping matters. Together they just come off sounding harsh, there’s absolutely no sign that any of them could carry a melody if they all had buckets with which to do so, and as if that wasn’t bad enough on top of all that their phrasing is jarring, sort of a half staccato shout that rattles your eardrums. The lyrics only add to the confusion as there’s absolutely no meat to the song, nothing to use to get across who he is or what he was up to, therefore nothing to build around. It’s merely rhythmic chanting, little more than a loose jam session, an example of them warming up before they really got down to business which somehow got put on wax and then released. Haphazard in its construction in terms of how the vocals relate to the music, therefore unrefined in its conception and forgettable in its execution. It all sounds messy and unrefined, two words you’d NEVER associate with Dave Bartholomew in the future. As such you have to look at this for simply what it is – a test run. A chance for him to feel his way around a studio for the first time, to put together a session, work out the parts and see how it’d translate to wax rather than on the bandstand, where they were able to sense immediately what type of crowd they had, what that audience expected and then to play off their responses to be able to deliver that. The studio was a different beast and this shows that even Bartholomew – who’d go on to define the art of studio recording over the next decade as much as anyone – wasn’t born knowing what worked and what didn’t, and so this otherwise forgettable foray became his training grounds. Amazingly, though it was the lone session he undertook at this time he learned his lessons well because when he next entered a studio two years later he rarely made a wrong step for the next fifteen years. If that’s all he got out of this experience then it was well worth the growing pains shown here. Though I shouldn’t have to tell you that won’t help his score with this one any, but hopefully it will be some consolation to know that when next we meet Dave Bartholomew, two long years from now, things will get better. A LOT better. Though you probably didn’t need me to tell you that either. Leave a reply on "Dave Bartholomew: “Dave’s Boogie Woogie”"